The island of Sakhalin extends along the Pacific coast for 950 km (Figure 18.1). With an area of 76.4 thousand km2, it is Russia's largest island. In terms of tectonics, Sakhalin is a part of the Sikhote-Alin — Sakhalin fold belt and is separated from the Sikhote-Alin by the Tatar Strait trough and the West Sakhalin trough. 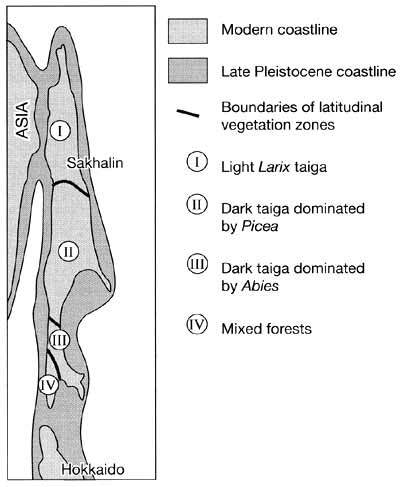 The formation of the Sakhalin island arc can be dated to the early Miocene since the calcalcaline volcanic rocks of Miocene age are found in abundance in the West Sakhalin mountains (Zonenshain et al, 1990). At the end of the late Pleistocene, Sakhalin was connected with the mainland and the island of Hokkaido by land bridges (Figure 18.3). A clear indication of this connection is the occurrence of dunes of aeolian origin in the north-west of the island. The dune chains extend along the Sea of Japan coast for about 250 km continuing into the Tatar Strait and the Sea of Okhotsk shelf (Korotky, 1993). A late glacial transgression, which began 17-18 Ka BP and proceeded rapidly at a rate of 9 m per 1000 years, has led to its isolation (Aleksandrova, 1982). At present, an 8 km wide Tatar Strait separates Sakhalin from the mainland in the north-west while Hokkaido is located 42 km southwards. The continuing uplift of the island (which is more rapid in its middle part) results in high seismic activity with earthquakes reaching 8 points on the Richter scale (Geology and Mineral Resources of Japan, 1977; Leith, 1995). 1. 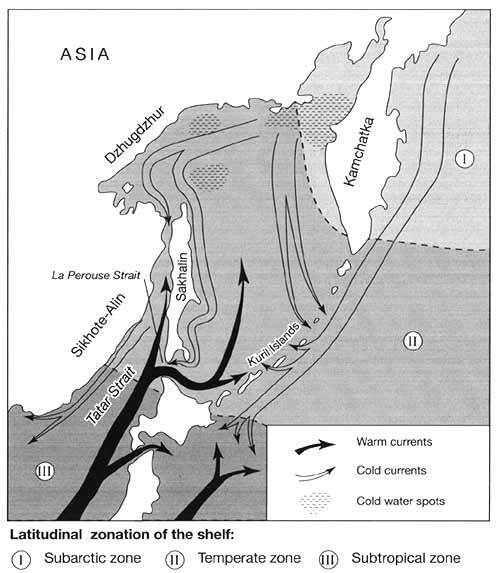 The main structural feature of the island is the Central Sakhalin graben, which extends longitudinally through the whole island and farther into Hokkaido, separating the West Sakhalin mountains and the East Sakhalin mountains. The graben is filled with thick (2-8 km) unconsolidated Neogene-Quaternary deposits. A chain of lowlands corresponds to the graben of which the Tym-Poronay lowland is the largest. 2. The East Sakhalin mountains, extending from approximately 49 to 52°N, are composed of strongly dislocated metamorphic pre-Cretaceous rocks. Folding and thrusting occurred at the Creataceous-Paleogene boundary. Paleogene strata overlie the nappes and the folded structures are cut by intrusions of biotitic granites and granitodiorites with an isotopic age of 58-66 Ma (Zonenshain et al, 1990). The ridges, broken by grabens of various ages filled by alluvial and fluvioglacial deposits in the early Pleistocene, are distinguished by non-structural erosional relief with numerous planation surfaces. 3. The West Sakhalin mountains formed in the late Pliocene-early Quaternary when the rocks of the West Sakhalin trough were thrust over unconsolidated deposits of the Tym-Poronay depression. Typical of the West Sakhalin mountains is structural denudational relief which developed as a result of selective erosion under the neotectonic conditions and changes in sea level. Although it is tectonic uplift which is primarily responsible for the deep river incision, a decline in sea level of 110-130 m, which occurred during the Pleistocene climatic minimum of 18-20 Ka BP (Korotky, 1993), contributed to the formation of rugged topography. While absolute heights vary between 300 m and 1300 m, deep intermontane depressions and river valleys are typical. The plains and low hills of northern Sakhalin are composed of gently inclined folded Neogene strata and are shaped by abrasion and denudation (Kulikov et al, 1993). The depressions located in its central part are filled with unconsolidated Quaternary deposits mainly of alluvial and, less often, marine origin. The lacustrine-alluvial and marine accumulative plains occupy coastal areas. Most of the western coast has abrasional relief with cliffs reaching 8-10 m in the north and 60-80 m in the south. At present, the western coast has completed its abrasional-accumulative cycle and has reached a stage of dynamic stability (Kaplin et al., 1991). The cold and humid climate of Sakhalin (annual precipitation ranges between 600 mm and 1200 mm; winter temperatures range between 10°C and 24°C below zero and summer temperatures do not exceed 13-15°C), resulting from monsoonal circulation and the cold Sea of Okhotsk waters which carry floating ice even in summer, predetermines the development of boreal landscapes across most of the island despite its location between 54°N and 46°N. While taiga, bogs, and coastal meadows develop in Sakhalin, forest-steppe, steppe and semi-desert biomes occur at the same latitudes in the East European plain. Only south-western Sakhalin has more favourable climatic conditions due to the ameliorating influence of the warm Tsushima current which predetermines the development of rich and distinctive vegetation. There are two main models of vegetation zonation. According to the earlier model, which dates back to the USSR Geobotanical Zonation Scheme published in 1947, Sakhalin belongs to the Eurasian zone of coniferous forests which is represented by Larix forests in the north and Abies-Picea taiga in the south. 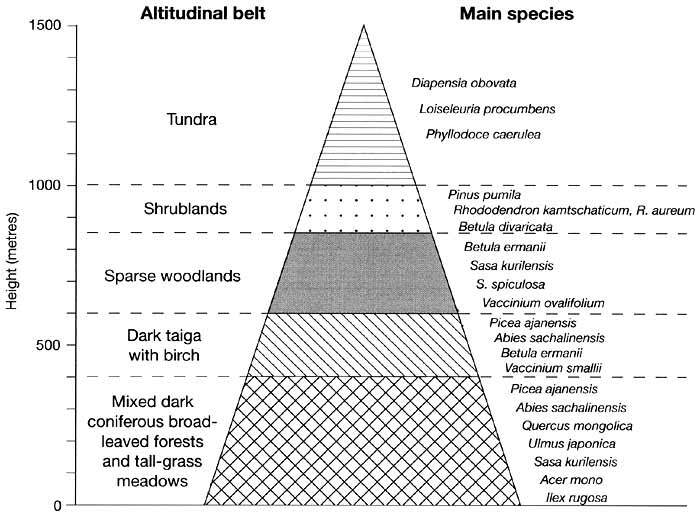 A later scheme recognizes four geobotanical entities (Figure 18.3): the light Larix taiga, the dark taiga dominated by Picea, the dark taiga dominated by Abies, and mixed dark-coniferous and broad-leaved deciduous forests (Geografla Sakhalinskoy oblasti, 1992). The subzone of larch taiga is represented by swampy open woodlands formed by Larix ochotensis with an admixture of Pinus pumila, Alnaster maximowiczii, Betula middendorfii, and B. exilis which intermingle with shrub-lands of Pinus pumila and sphagnum bogs. Picea forests develop in the better-drained uplands. The dark Picea taiga formed by Picea glehnii, P. ajanensis, and Abies sachalinensis develops in the mountainous areas of the middle Sakhalin while in the valleys forests are formed by small-leaved deciduous species (e.g., Betula, Alnus, Salix, Populus, and Chosenia) and locally by heat-loving broad-leaved species (e.g., Quercus mongolica, Ilex rugosa, Ulmus ladniata, and Acer mono) (Manko, 1967; Ageenko et al., 1973). Vertical zonality is well-marked in the East Sakhalin and West Sakhalin mountains (Tolmachev, 1956; Ogureeva, 1999), (Figure 18.4). South of 48°N, forests dominated by Abies sachalinensis with an admixture of Picea ajanensis, P. glehnii, and broad-leaved species, especially Quercus mongolica, prevail. The participation of southern species is notable and tree and shrub floras are enriched with such species as Viburnum furcatum, Aralia schmidtii, and Ilex crenata. Bamboo (Sasa kurilensis) forms dense undergrowth in forests as well as thick thickets in non-forested locations. Tall-grass meadows of a simple floristic composition, comprised mainly of such species as Polygonum sachalinensis and Cardiocrinum glehnii, are also typical of this part of the island. The most unusual and rich vegetation develops in the south-west of Sakhalin. There are relatively few endemics (about a hundred out of 1500 species found on the island including Eupatorium sachalinense, Viburnum wrightii, and Polygonum sachalinensis) because Sakhalin became isolated from the mainland only recently. Rather, the specific character of the vegetation is manifested in the combination of boreal and southern species, and also in the development of gigantism, which is a very prominent feature. The mixed broad-leaved coniferous forests contain many Manchurian and Japanese woody species, vines, and bamboo. Such southern species as Phellodendron sachalinense, Quercus crispula, Kalopanax septemlobus, and Toxicodendron orientale grow alongside Picea and Abies. The development of gigantism in woody and herbaceous plants is predetermined by an optimal combination of heat and moisture as well as the fertilizing effect of sea salts and the abundance of microelements in the soil due to recent volcanic activity (Morozov and Belaya, 1988; Morozov, 1994). In riparian habitats, these factors are enhanced by the high contents of phosphorus and nitrogen in the soil which is due to the decomposition of fish that enter the rivers to spawn and die. Plants attain lavish growth: in riparian habitats Chosenia macrolepis reaches 25 m in height and Populus maximowiczii attains 8 m in cicumference. Herbaceous plants, such as ferns (Struthiopterisfilicastrum), umbellates (Angelophyllium ursinum and Heradeum barbatum), Cacalia hastata, Senecio cannabifolius, and Filipendula kamtschatica, attain 2-3 m in height. Such vegetation communities are unique and apart from Sakhalin occur only in the southern Kurils and northern Hokkaido. The primary vegetation of southern Sakhalin has been extensively damaged by fellings and fires. Secondary communities are formed by forests of Betula ermanii, bamboo thickets, and meadows and there is no clear vertical zonation in the mountains of southern Sakhalin. With a population of 650 000 Sakhalin remains relatively undeveloped. Coal mining, the production of gas and oil, timber industry and fisheries are the major industrial activities, while agricultural lands (excluding reindeer pastures) cover just above 1 per cent of the territory. However, general statistics conceal some important regional differences. While in northern Sakhalin reindeer herding is the main occupation outside the rapidly growing gas and oil production, the middle and southern parts of the island are under much greater anthropogenic pressure. The timber industry dominates middle Sakhalin producing about 3 million m3 of wood per annum and targeting coniferous forests which have an important protective role with regard to soil erosion and maintenance of the healthy spawning grounds (Sakhalinskaya oblast, 1994). In many areas, timber resources have already been exhausted and yet production continues across the region, reducing coniferous forests by 15-19 ha a-1. These rates are unsustainable given the lack of reforestation efforts and slow natural regeneration which is impeded by such fast-growing species as tall grasses and bamboo. About 70 per cent of all the Sakhalin population is concentrated in the coastal zone and plains of southern Sakhalin which account for about 20 per cent of the total area. This region has the longest history of development which dates back to the mid-19th century, focusing on coal mining. Accounting for about a half of the total industrial and agricultural output, this part of the island is under the strongest anthropogenic pressure. The development of major offshore gas and oil reserves may prove a mixed blessing for the island. The Sakhalin shelf contains rich deposits of high quality hydrocarbons which may provide the region with economic and energy security and political benefits (Shelf Sakhalina, 1975; Paik, 1995). However, many environmental scientists and activists express their concern about the potential impact of high seismic activity (Tkalin, 1993). Although environmental impact assessment was conducted at the beginning of 1997 and the project incorporates protective measures, doubts over safety remain given the sad history of inadequate implementation of such measures in Russia.